Problem D10: Consider an ideal gas that is confined to a container. The gas undergoes the cyclic quasi-static process shown in the graph below. The cycle consists of two isothermal processes (constant T) bounded by two isometric processes (constant V). The gas starts off with a pressure of P0 and a volume of V0. The gas is first heated up with a constant volume to a pressure n2P0. Then it expands isothermally to a volume en1V0. Next it cools down with a constant volume. Finally, it is compressed isothermally to its original state. 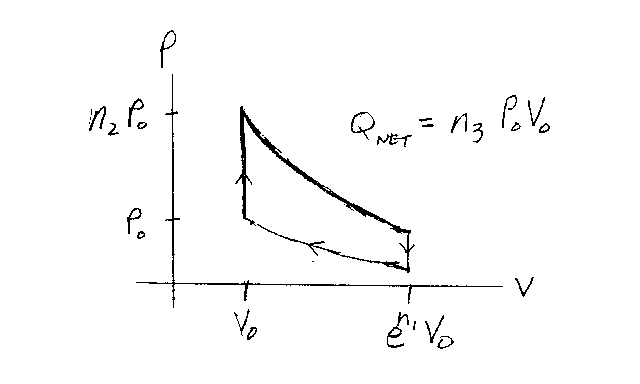 If the net heat energy given to the gas is Qnet=n3 P0V0, what is n3? Note that n1, n2 and n3 are unitless.